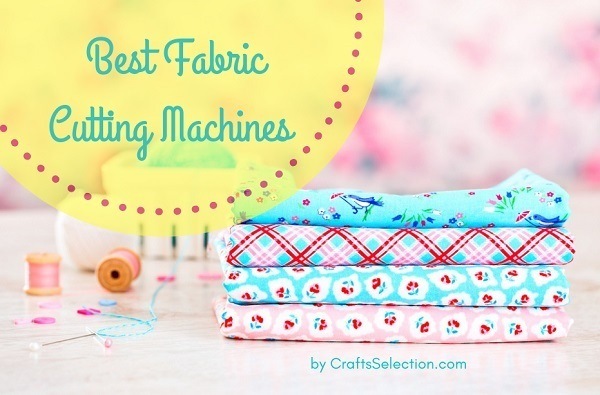 Which Is The Best Heavy Duty Sewing Machine To Buy? If you have ever wondered, “What is the best heavy duty sewing machine?”, then let us congratulate you. You have come to the right place. 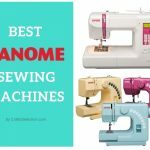 The following table will give you a brief overview of the best sewing machine for thick fabrics, the brands, and their overall ratings. The choice is yours, but rest assured that at the end of this guide, you will have chosen the best heavy duty sewing machine for you. 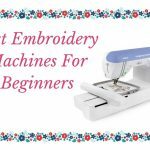 You can either dive directly into the list of the top heavy duty sewing machine models (below) or go through our short heavy duty sewing machine guide to familiarize yourself with the current sewing machine market, the best-selling features, and few handy tips. 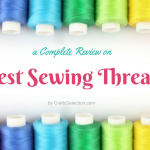 Just go through each of the heavy duty sewing machine reviews and pick what works best for you. 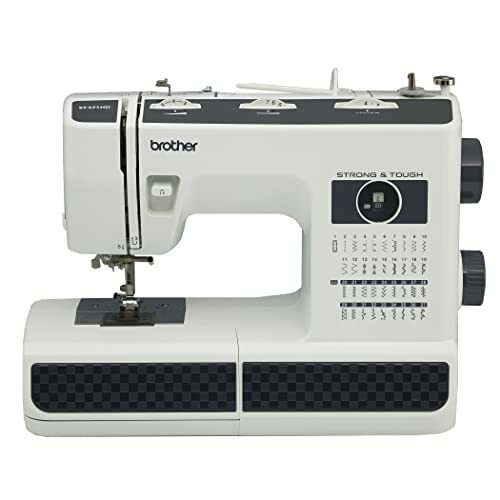 A lightweight workhorse that can sew most types of fabrics, this is a relatively newer mechanical model by the king of sewing machine brands – Brother. The Brother ST371HD comes with 37 built-in stitches that will actually come in handy for your small home business. Are you always on the lookout for decorative stitches to your clients? 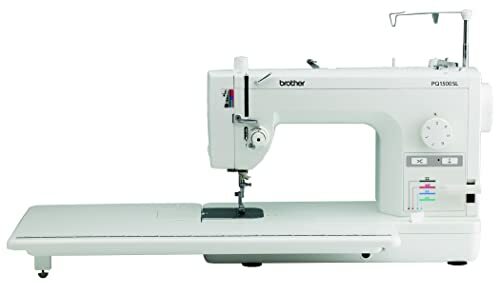 This Brother heavy duty sewing machine can also be your fashion assistant with its variety of stitches including blind, zigzag, and buttonhole. The 6 types of sewing feet is another great advantage. The zipper foot and free arm are something that you are going to use on an everyday basis. 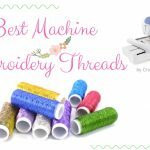 One-step buttonhole, double needle, automatic bobbin winder, quick needle threader, and a single-dial operation are other top highlights. And while you are working on your projects, don’t worry about straining your eyes because the working area is lit with long-lasting LED light. Blind hem a pair of jeans or work on a tote bag for your online store – this model is arguably the best in this price range that is both versatile and portable. It is designed to sew through all types of materials – from lightweight silks to heavyweight fabrics like leather and denim – thanks to the strong needles and powerful motor. We tested it on 6 layers and the needle sews through like on butter. 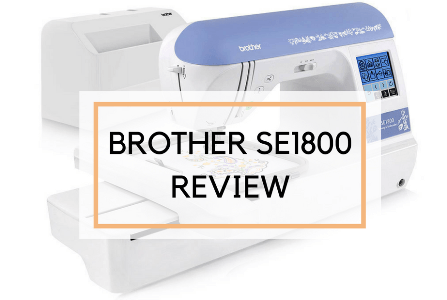 While this is not the lightest machine we have reviewed, the Brother ST371HD Strong and Tough Sewing Machine certainly can be packed in a small bag and taken along. It is best to check the instruction manual or DVD for the correct needle type and size before working on specific heavyweight fabrics like suede, leather, canvas, nylon webbing, etc. Brother is a leader in the sewing machines industry, and with this cheap heavy-duty sewing machine, it leaves nothing for us to complain. Can be mastered by both beginners and advanced users. If there’s a brand that can give Brother a tough competition, then it is Singer. 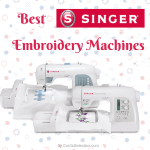 Regarded as the best portable heavy duty sewing machine for beginners, this Singer model has all the bells and whistles of a modestly-priced machine. 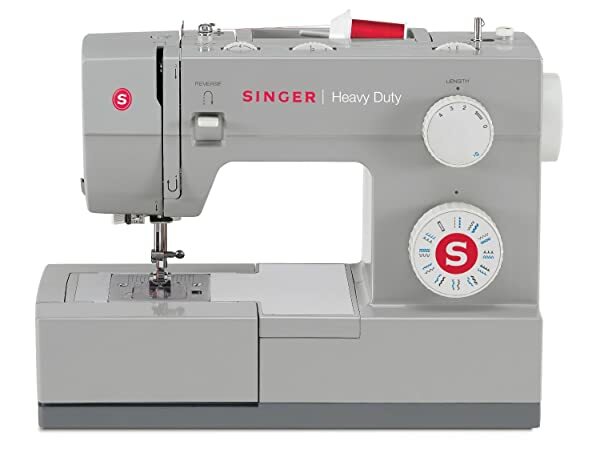 Over 35% faster than the Brother model above, the Singer heavy-duty 4423 sews at a speed of 1100 stitches per minute, which is like a dream come true for professional sewers. It is made of heavy-duty interior metal frame that adds “weight” to the machine. This prevents the machine from “walking” so that you can carry on with your sewing without a skip. The powerful motor takes care of all your heavyweight fabric sewing needs and has enough torque-generating capacity to tackle stubborn materials. Singer claims that “it can sew through just about anything you throw at it.” So, we went ahead and tested it. We tried sewing a leather sheet, a piece of suede, cushion cover, and a 6-layered vinyl upholstery item, and trust us, the results blew our minds. Convenience features like automatic threader, easy bobbin loader, and automatic one-step buttonhole are other hard-to-resist features of this Singer 4423 heavy-duty sewing machine. Another nifty little feature that we love is the (transparent) clean view cover that helps you keep a check on the bobbin thread supply. Trivia – When a machine does not stay in one place while sewing and wobbles – what is known as “walking” in the sewing community – is one of the primary reasons why professionals opt for a heavy-duty sewing machine. 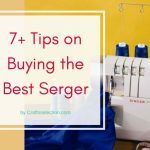 If you want something more out of sewing machine that is lighter and faster than its immediate competition and if you are a fan of Singer, don’t think twice. Well-suited for both beginners and advanced users, the Singer 4423 is the best affordable sewing machine for thick fabric on this list. One of the best sewing machines for denim, this model by Janome is known for its simplistic design and strength. This is a no-nonsense sewing machine for users who do not dillydally around. 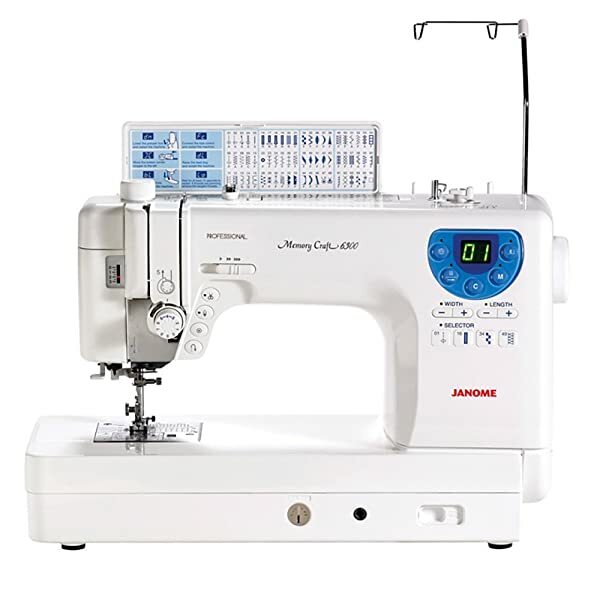 With the Janome HD3000, you can just plug it and start working on your projects. The controls are all on the front panel, encapsulated around a heavy-duty aluminum body for extra strength. Because it’s aluminum, it’s also lightweight, weighing just over 18 pounds. With 18 stitch options including one-step buttonhole, four presser feet, automatic bobbin winder and needle threader, Janome has left nothing for chance in this model. Instead of giving you a lot of utility and decorative design options, it focused on a strong motor that can drive that needle over 10 layers of denim. We tested different types of materials and combination of layers and this Janome heavy-duty sewing machine breezed through all of them, reinforcing our trust in Japanese technology. The five feed dogs will also come in handy, especially when dealing with rough/sticky materials like suede or velvet. Another reason why we love Janome is that it understands our sewers’ needs and has built a storage compartment right at the top of the machine. How thoughtful! Say goodbye to your sewing woes by investing in this simplistic sewing machine that sits where you keep it without moving an inch. Brother markets it as a “quilter’s dream machine” and we can second to that. One of the best quilting sewing machines that we have ever reviewed, it is notable for its large workspace. Just one look at the Brother PQ1500SL and you will fall in love with it. 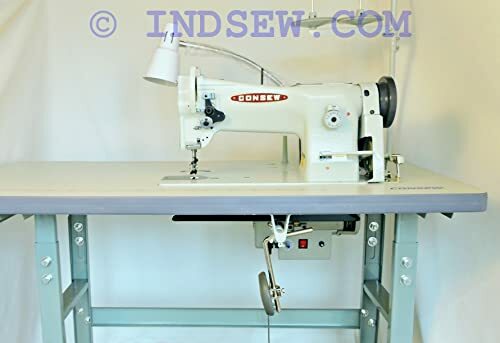 Its large extension table that allows you to feed long and broad fabrics to the sewing plate without looking like you are handling a lathe machine. The 4 different feed settings are like icing on the cake. It is primarily a straight stitch sewing machine, which means it generates various kind of stitches in a straight pattern (as opposed to zigzag and curvy ones). This may sound like a demerit at first, but then who wants multiple decorative stitches when you can get the job done in seconds? It also boasts of a thread tension adjustment dial, a pin-feed mechanism for fabric management, and bright LED light to avoid eye strains. 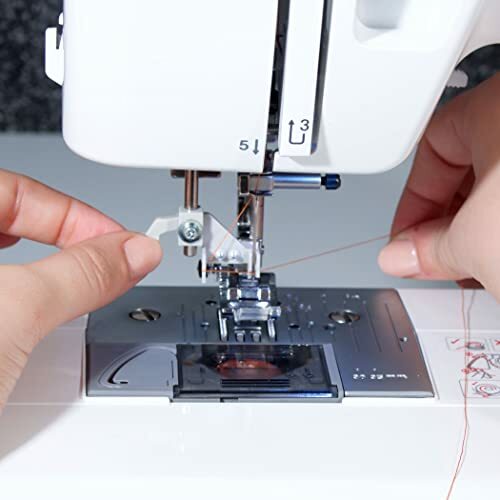 Perhaps the best feature that distinguishes it is the thread cutter – arguably the most loved feature on sergers – that cuts the thread at the end of each sewing session. Lastly, it’s a heavy machine. Weighing at around 28 pounds, it’s never going to shift, regardless of what material you throw at it, giving you absolute bang for the high price. Brother’s tech support is exceptional, so product registration is highly recommended. The Brother PQ1500SL is the best heavy duty sewing machine for quilting with its large work space and high stitching speed. Perfect for home-business owners and designers who have large quilting projects that need to be done in less time. We already told you how Janome is ahead of all of us in its product designs. And this heavy duty computerized sewing machine is perhaps the best example we can think of for superior quality sewing and quilting. Consider an ideal quilting experience and think of all the necessary features that you would want in the quilting sewing machine – needle up and down setting, a long and wide throat space, thread cutter, and different types of feet. Now take a look at Janome MC-6300P, perhaps the only modestly-priced hi-range quilting sewing machine on this list. It is equipped with 66 stitches and 4 buttonhole settings to take care of your utility and decorative needs, a knee lift and drop-in feed control, and few monogram stitches for those special cases when you want to embroider a little. Like the quilting model in the mid-range, this one also aids in free-motion quilting without any hassle. 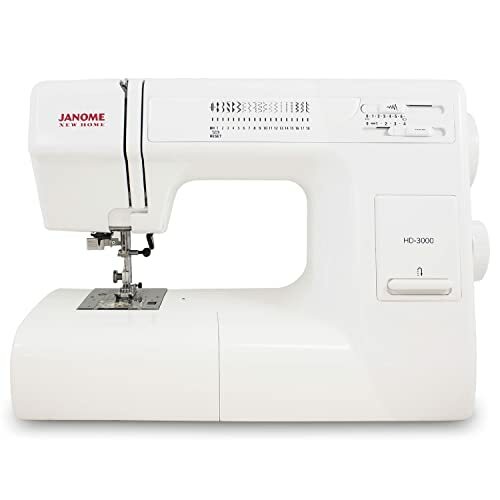 This Janome model is intended for those who don’t care much for different types of stitches and want a sturdy machine instead. It is also loved for its thread cutter. The large workspace (9 inches) is enough for your quilting needs, and there is no limitation to the types of materials you can sew in it. Overall, it’s a heavy-duty and smooth machine that is capable of a lot of things you are yet to imagine. Going through the instructional manual and the list of accessories will break open the infinite number of possibilities with this little powerhouse. Little things like the hand wheel control for appliqueing are what makes it our choice for one of the best professional quilting sewing machines. You can achieve a super slow speed using the hand wheel and/or knee lift feature. Get Janome MC-6300P and enjoy ideal quilting experience today. It won’t let you down, we promise. Another American underdog brand, Consew has been around for over a century. This model here is the perfect product of technological advancement over the years. We have mostly focused on heavyweight fabrics on this guide because that’s what heavy-duty machines are for. But, if you have ever wanted a machine that could take care of all types and widths of fabrics without compromising on the quality of the sewing, turn to Consew. It’s perfect for shifting between different fabrics for different sewing projects – just switch the needle and get on with it. Although it requires a mandatory table and external motor (that usually comes with the package), the Consew 206RB-5 performs like a pack of horses in a single unit. The triple feed mechanism is like Godsend to any sewer because you will never have to worry about the fabric from lifting or offsetting. This is like a distant cousin of Janome HD3000 because it only sews straight stitches and does it like a ninja – no noise, no breaks. Having said that, this is not a commercial machine and definitely not suitable for beginners. It is the kind of heavy-duty industrial sewing machine that toils without complaining if you take care of it like a real engineer (periodic oiling, cleaning, and of course, operation). This model requires regular oiling (between every eight hours of use). We recommend keeping a bottle of ISO-22 grade spindle oil always handy. For instructions, just check the manual or Consew’s website. An advanced user (a professional fashion designer, a sailmaker, textile factory worker) will fall in love with the sight of this Consew marvel. For everyone else, we recommend checking out the Janome and Sailrite options. Whether it is a sewing machine for leather or something heavier, our list has one for three different price ranges. 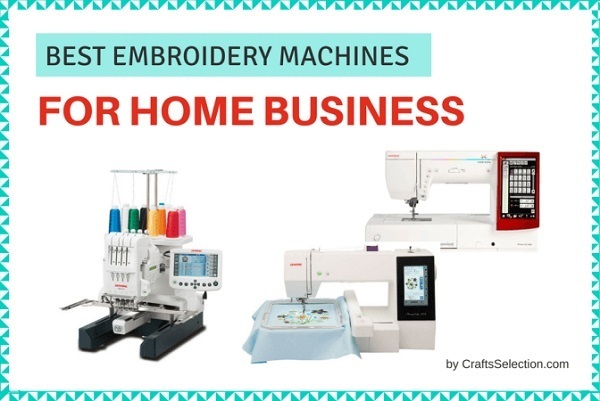 There are machines that retail for under $200, mid-range models (under $800) that are perfect for home businesses, and hi-end powerhouses perfect for fashion designers, business owners and professional sewers. For some users, the reason to move to an advanced model is only one: the need for a more powerful sewing machine that can get things done faster and without breaking a sweat. They don’t much care for extra baggage, which also, fortunately, reduces the cost. If you identify yourself as one of them, select one from two models above. If you expect a little more out of your sewing machine (which you should, now that we are in the 21st century), consider these two workhorses with a proven track record among professionals. We know what exactly you are looking for. You want all things powerful, computerized operation, digital controls, maximum versatility, and overall a machine that is incredibly customizable. These two sewing machine models are handpicked. Each one of us has different requirements and tastes. That is why we have listed two to three products under each price range. But, if you still ask us to choose the best one, we will. Nonetheless, we still suggest that you go through all the details and check out the individual products before hitting the “Buy” button. Whichever model you choose, rest assured that you are going with the crème de la crème. 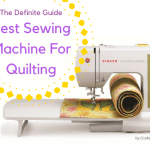 This list and the brief guide are creations of days of offline and market research, analyses of sewing machine brands and models, testing, expert analysis of features and specifications, and importantly, consideration of user requirements. We have taken into account the peculiar needs of advanced users (like you) to create this guide, which is obviously not for those who are in the learning stage. If you are the kind of person who would rather create beautiful creations using your new machine than spending your time on reading detailed analysis, just choose the one that fancies you, order, and wait for the delivery man to show up. 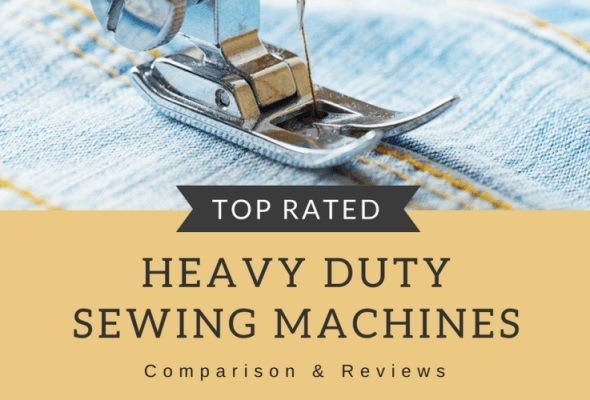 If you are like us – pedantic when it comes to all things sewing – go through the best heavy duty sewing machine reviews then make your decision. All six of heavy duty sewing machines featured above have impressed us beyond doubt. They are all capable of aiding you in your creative projects and helping you succeed in your endeavors. We will be glad to know which one you choose. Enjoy sewing! For sewing lightweight leather, I’ll recommend the Singer 4423 model (reviewed above). 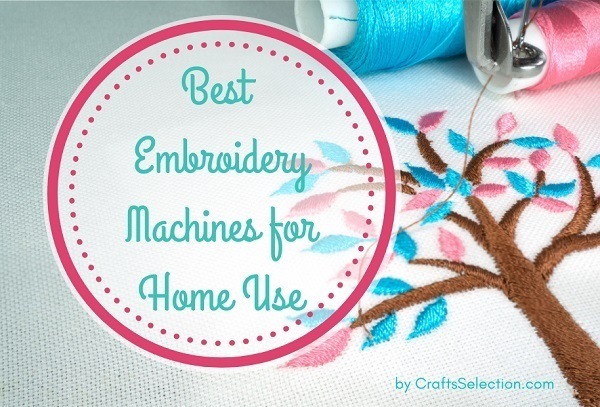 This machine is sturdy and powerful enough for home sewing and mending tasks. My sister has had it for about two years and she is still very happy with her choice. She uses it almost everyday making canvas bags, tents for her kids and reupholstering her couch. This machine also comes at a very affordable price. So this may be the machine you’re looking for. Hope this helps. I’m looking for a machine that will see rope projects. Like sewing clothesline rope baskets/rugs. What would be your suggestion? Thanks for your question. For home users, I would recommend the Janome HD3000. 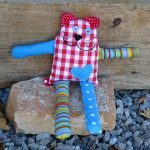 It is very simple and easy to sew. You can do a wide range of sewing with this machine. Give it a try! I’m looking for a sewing machine that will sew through cotton. Canvas and leather. Any suggestions? If you need that machine for home sewing, I will suggest the Singer 4423 Heavy Duty Sewing Machine. It is sturdy and strong enough to sew through some layers of canvas and leather. The price is reasonable too. For regular users and professional seamstress, I will suggest the machines in the “Mid-price” and “Hi-range” categories. Personally, I love the Sailrite BASIC. It sewed through four layers of leather with no issues at all. Very pleased to see how it worked.